I am a Man and this is why I’m fighting for equality for all. A blustery Chicago afternoon. The iconic marquee outside of Wrigley Field announces the visiting team: the Brooklyn Dodgers. Thousands of African-Americans flood inside, many of whom likely never have even been to a baseball game. As a seven-year-old, I wasn’t sure why this was happening. At previous games, when I gazed out at the ivy-draped stands, I largely only saw white faces. Jackie Robinson stepped up to the plate. He was in his rookie year and the first African-American to play major league baseball. The crowd of new fans went wild. They didn’t care which team won; they just cared that Jackie was on the diamond. But that made no sense to me. If Jackie could play the game, what difference should the color of his skin make? Shouldn’t the only thing that matters be whether he could hit a home run or field a hard-hit ball to the right of second base? And Jackie certainly could play. He would go on to win Rookie-of-the-Year. Sports always have provided a sanctuary for me. As a child in Chicago, I remember walking into the local Recreation Center and feeling a sense of peace. My family was somewhat affluent and that sometimes embarrassed me. But when I walked into that Recreation Center, none of that mattered. We had an African-America park director. First-stringers were picked on the basis of talent, not race or wealth. The same applied to the rest of us. You could be on the team and go to the game so long as you could fit in Coach Bill’s car. Still, this wasn’t exactly equality for all. I also remember playing in the streets with my older sister and a handful of neighbor kids. We’d do typical child games, like dodge-ball and jumping off a fence into a sand pile. The girls were just as athletic as the boys, but when we went to school, they were sidelined. There were plenty of sports teams for the boys, but none for the girls. That didn’t seem fair. If they had the talent – which they did – shouldn’t they be able to play too? This lack of equal athletic opportunity for women always has weighed heavily on my heart. At UCLA, I played intramural basketball and was the sports director for my fraternity. Yet the moment that touched me most was when I watched the UCLA women’s basketball team win the national championship in 1978. I sat in the stands in Pauley Pavilion and was awestruck as these remarkable women enjoyed a taste of the adoration routinely given to men. Another barrier broken. So powerful was the emotion that many of us, including myself, openly cried. When I began teaching at Loyola, I continued following women’s sports including helping Professor Allan Ides locate a high school where his daughter could hone her basketball skills. They picked the Brea Olinda Ladycats. I started attending games – including championships -- and ultimately was asked by Coach Jeff Sink to volunteer to be the team statistician. I also coached the spring practice league as a volunteer. When asked what was my basketball philosophy, I responded it was to have fun. I treated the team members as people, not just second-class players to their male counterparts. I now assist at Windward High School in Palms. And every time I walk into the gym, I feel that wonderful sense of nirvana that goes back to playing under Coach Bill. The craziness of the world is checked at the door. Once you’re on the playing field, all that matters is your ability and desire to play. My sense of equality was instilled in me before that first game at Wrigley Field with Jackie Robinson. I knew then what I know now. Box scores don’t include a player’s race, religion, or whether they are gay or straight. In sports – as in life – everyone has an equal right to participate. Editor’s Note: Professor David Tunick has been teaching at Loyola Law School, Los Angeles since 1974. 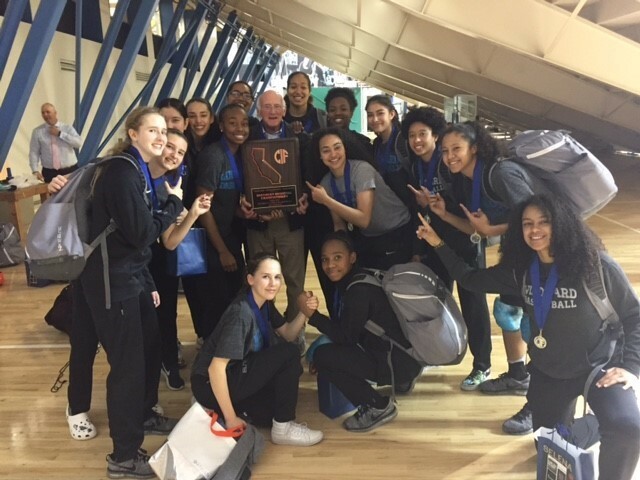 He’s pictured here in a photo with the Windward High School girls’ basketball team, where he assists Coach Vanessa Nygaard. The team just finished up a fantastic year as the 2017 California State Champions. Professor Tunick served at Brea Olinda for eleven years and begins his third year at Windward this fall. He has always served both organizations as a volunteer. He attends as many games and practices as possible to fully support the team. In terms of the 1978 Women’s National Championship, the UCLA Bruins solidly beat the University of Maryland by a score of 90-74. For more info, click here. For those of you who are Amazon Prime members, you can watch “The Jackie Robinson Story” for free. (“42” also is available for a fee.) Robinson was inducted into the Baseball Hall of Fame in 1962. Every year on April 15, the league celebrates “Jackie Robinson Day” and every player wears the number “42” in his honor. For more information on his incredible life and career, click here.